Mandatory pre-applications to the Heritage Partnership Program will be due Friday July 18, 2014. Note that the external partnership program has been revised--please read the new guidelines and check deadlines before submitting your proposal. When developing your project timeline, keep in mind that all projects must be completed and funds spent by June 30, 2016. Questions? Contact Melinda Hutchinson, 651-259-3459. The research, conducted in preparation for an exhibit to commemorate the 100th anniversary of World War One, resulted in the production of valuable new knowledge about Murray County's contribution to and experience of the Great War. Bell Museum of Natural History to relocate soon. 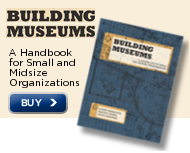 What is the future of the museum store? What if our approach to historic preservation changed? Smithsonian Institution, Washington, DC, seeks Museum Curator (Latino History and Culture). Deadline: July 10, 2014. Los Angeles County Museum of Art, Los Angeles CA, seeks Senior Database Manager. Tempe History Museum, City of Tempe, Tempe AZ, seeks Museum Manager. Minnesota Military Museum, Camp Ripley MN, is proud to honor Minnesota Veteran Lt. Colonel Reul Pietz, St. Cloud MN, as the featured Veteran of the Month for July 2014. Call 320-616-6050 for more information on the Veteran of the Month program. Carlton County Historical Society, Cloquet MN, will be open to visitors on Friday July 4, 2014, 9 a.m. to 5 p.m. Call 218-879-1938 for more information. Blue Earth County Historical Society, Mankato MN, invites the public to an old-fashioned Independence Day celebration, July 5, 2014, 11 a.m. to 3 p.m. Call 507-345-5566 for more information. Northfield Historical Society, Northfield MN, announces that Northfield History Month will come to a close on Friday July 4, 2014 with a vintage base ball game and evening fireworks. Free. Call 507-645-9268 for more information. Stearns History Museum, St. Cloud MN, hosts "Basics of Researching Your Family History," with archivist Sarah Warmka, Tuesday July 8, 2014, 7 p.m. Come early to attend the "Intro to the Research Center and Archives" class, 6:30 p.m. RSVP to Sarah Warmka, 320-253-8424. Stearns History Museum, St. Cloud MN, hosts author Rhonda Fochs, who will speak on "Minnesota's Lost Towns," Wednesday July 9, 2014, 9 a.m. Call 320-253-8424 for more information. Minnesota Lakes Maritime Museum, Alexandria MN, hosts "The Maximilian-Bodmer Expedition: Travels in the Interior of North America, 1832-1834," by special arrangement from the Joslyn Art Museum, Omaha NE, July 9-September 30, 2014. Call 320-759-1114 for more information. Washington County Historical Society, Stillwater MN, hosts Rep. Dean Urdahl, who will speak at the Warden's House Museum on the conspiracy and theories surrounding President Lincoln's assassination, Sunday July 13, 2014, 2 p.m. Call 651-439-5956 for more information. Stearns History Museum, St. Cloud MN, hosts Minnesota author Carolyn Boehlke at the next Granite City Book Club, Wednesday July 16, 6:30 p.m. Call 320-253-8424 for more information. St. Louis County Historical Society, Duluth MN, presents author Tony Dierckins, who will speak on "Duluth's 1889 City Hall," Thursday July 17, 2014, noon to 1 p.m. Call 218-733-7568 for more information. Tickets are on sale for the Anoka Heritage Home and Garden Tour, July 13, 2014, 1-5 p.m. This summer's tour features Swede Town neighborhood. Tickets: $12 in advance; $15 on day of the tour. Call 763-421-0600 for more information. Kandiyohi County Historical Society, Willmar MN, will host a bus tour to New Ulm MN, July 24, 2014, 7:30 a.m. to 5 p.m. Cost: $55--includes bus ride, tours, and meal. Call 320-235-1881 to register. Deadline for registration: July 18, 2014. Scott County Historical Society, Shakopee MN, announces that charcoal and colored pencil drawings of prominent Dakota men of the 1850s by artist Bill Durand are on display at the historical society, now through August 2014. Call 952-445-0378 for more information. Wright County Historical Society, Buffalo MN, announces a series of youth-only history day camps, 1:30 to 2:45 p.m. on select Tuesdays throughout the summer. Contact WCHS, 763-682-7323, for more information. Erin McClelland hosts "Selecting Strong Imagery for Interpretive Stories," a free webinar to be held Tuesday July 8, 2014, 10-11 a.m. CDT. Register online. Presented by the Cornerstone Academy program of Preservation Alliance of Minnesota, in partnership with Minnesota Historical Society, the class, Understanding Historic Tax Credits, is limited to 25 participants and will be held Wednesday August 6, 2014 from 10 a.m. to 4 p.m. at the Lower Post, Historic Fort Snelling. Cost: $79. National Scenic Byway Foundation is partnering with Historic Roads for the "Preserving the Historic Road 2014" conference, September 26-28, 2014, Savannah GA. Early Bird registration ends August 1, 2014. Scholarships available; contact Sally Pearce for more information. Minnesota Council of Nonprofits announces their 2014 Annual Conference will be held November 6-7, 2014, Saint Paul RiverCentre. Register by July 26, 2014 for Super Saver rate of $149. Minnesota Military Museum, Camp Ripley MN, seeks photos, stories, and artifacts used and worn by Vietnam veterans, from all branches of the service, Viet Cong, and North and South Vietnamese, for a July 2015 exhibit. Contact Doug Bekke if you have questions or would like to participate in this exhibit, 612-729-7651. Hands-All-Around Quilters will sponsor a Show of Small Quilts during Braham Pie Day, August 1, 2014. The group issues a Call for Entries; deadline: July 25, 2014. Request registration forms, 320-396-2683. National Trust for Historic Preservation announces this year's "11 Most Endangered Historic Places." Stearns County will be the location for "Minnesota 13: From Grain to Glass," a documentary about local Prohibition history. Contact Elaine Davis, 612-968-1109, for more information. Minnesota State Arts Board announces that the FY 2015 Partners in Arts Participation grant applications will be due Friday September 12, 2014, before 4:30 p.m.
National Park Service announces that the Maritime Heritage Program has grant funds available for preservation and education projects that promote understanding of America's important maritime history. Deadline: September 23, 2014. Blue Earth County Historical Society, Mankato MN, will celebrate Independence Day at the historic Hubbard House on both July 4 and 5, 2014. What will your historical organization be doing for the Glorious Fourth? Want to see your organization in the Field Note spotlight? Send a photo and short blurb to Local History News to update your colleagues on what you are doing for local history/field services. Liberty and Power: the Politics of Jacksonian America, by Harry L. Watson.